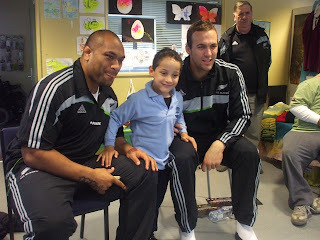 On Thursday, Wayne Smith (the “backs” coach of the All Blacks), Bryn Evans and Neemia Tialata (current All Blacks) came to visit the Pre -School and Primary School Conductive Education children at Addington. We asked Wayne Smith if he knew about Conductive Education and he said he had visited lots of times and he thought it was fantastic because it teaches children every day skills. It was Bryn and Neemia’s first visit and they were both very excited. After introducing themselves, the men met all the children and gave them a poster each. 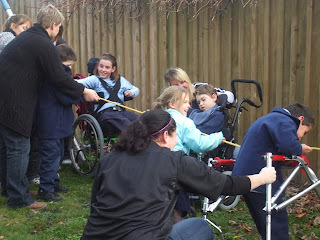 Then we all went outside for a game of “tug -of-war” . Conductive Ed verses the All Blacks!!! Conductive Ed WON!!!!! 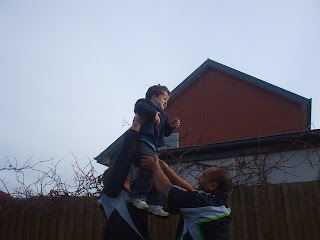 Next Bryn and Neemia practised rugby line outs and scrums with the children. Brittany from our school caught the ball in the line out. Go Brittany!! Then we asked Bryn and Neemia about being an All Black and they told us that they both get nervous before a game, but that was a good thing. They had both had serious injuries including Bryn’s ankle and Neemia’s problem with his knee and ear. For them, being part of a team was the best thing about being an All Black, especially hanging out with their mates. The afternoon was lots of fun and we all got a chocolate frog at the end.